Long, LONG AGO, Emily asked me to answer the registry questions. Honestly, I thought about being a good example and answering them when I first wrote that post, but apparently I am a hypocrite some of those questions are HARD and require MUCH THOUGHT, and I have a hard time picking favorites and I'm not known for my brevity of response. But! I've been on vacation for a while now! And I haven't felt my brain seeping out of my ear ONCE during that time, so I thought I would try to answer those questions now! I will start with two of the questions and will answer the others later just in case your eyes are ready to fall out of your head by the time I finish with these two. Do you have any decorating themes in your home/office? We have had the "college student/hand-me-downs/garage sale" theme in our house for many years now, and, although I like to blame the children for that ("But it's no use having nice things! The children just break/ruin everything! ), it is certain possible that "decorating" and "themes" are not among my talents! However, at some point, I discovered that you can pick a certain item you like and use it to help you decorate an entire room! I used the colors in the quilt to help me decorate in the bedroom. 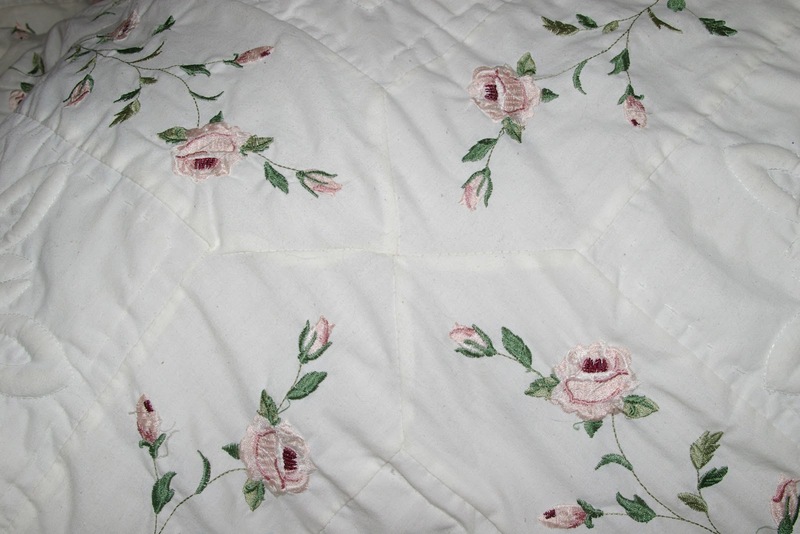 I tried to match the sage-colored binding on the quilt with paint chips for the walls. It didn't come out exactly right (next time I'll just take the quilt to the paint store with me), but it's close enough. 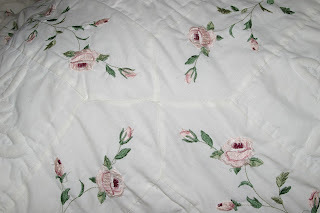 We had curtains in the bedroom of our last house, and they were lacy ivory with roses embroidered on them. 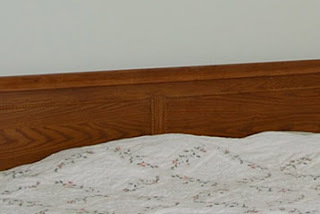 If I were to pick out any other things for the bedroom (what else is there to pick out for the bedroom? ), I would probably pick medium-dark rose or dark sage green. I can't remember the name of the pattern now...it was "Grape Bordeaux" or something like that. 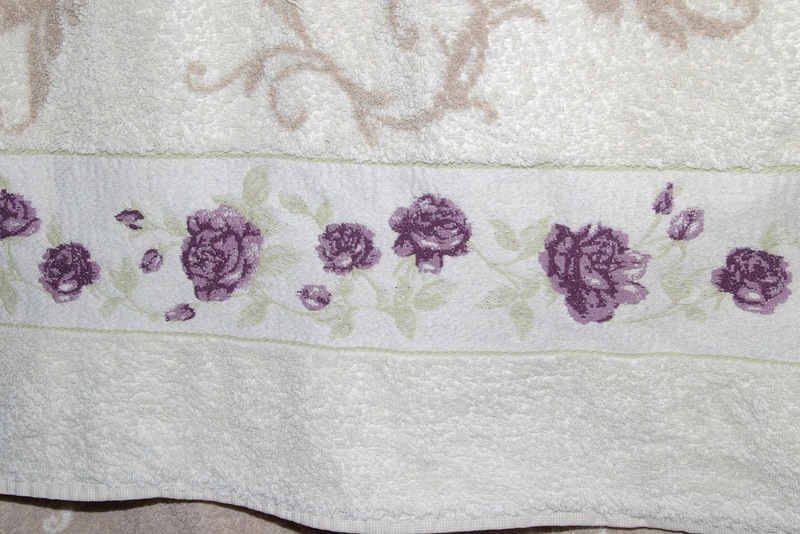 I bought a few of the towels with the patterned design and found some cloth to make a curtain for one window. The other towels and washcloths are medium and dark purple. 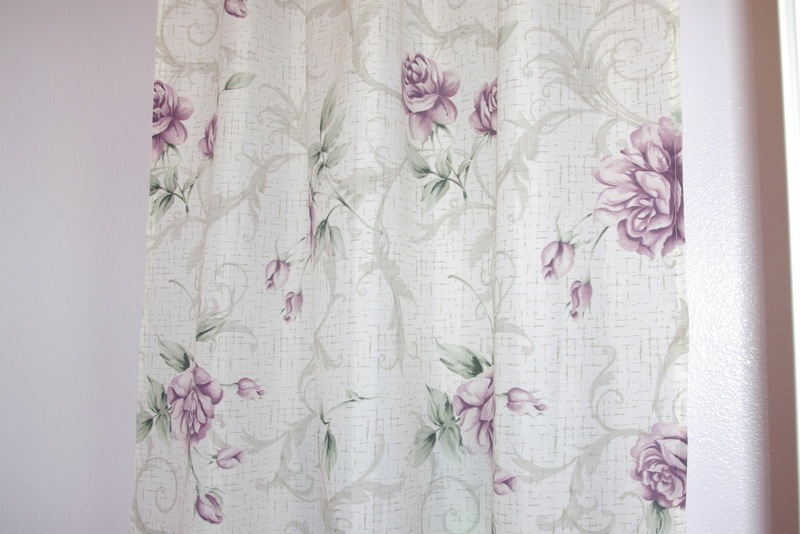 This curtain is perfect for the little room where the t0ilet is because it doesn't make the room dark. Some idiot one put two HUGE, TRANSPARENT windows facing the bathtub and shower. 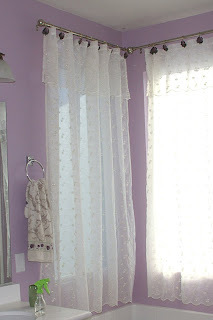 We put "privacy" stuff on the windows, and I found shower curtain hangers in the same pattern as the towels, and used two ivory, sheer, embroidered shower curtains to further cover/decorate the windows. I also tried to match the paint for this room to the colors on the towels; the paint in the main bathroom is a little darker than the paint in the smaller room with the t0ilet. I wasn't sure how I was going to like it, but once I had it all finished I decided that I really liked the way it looked! For accents in this room, I tend to pick medium-dark shades of purple. 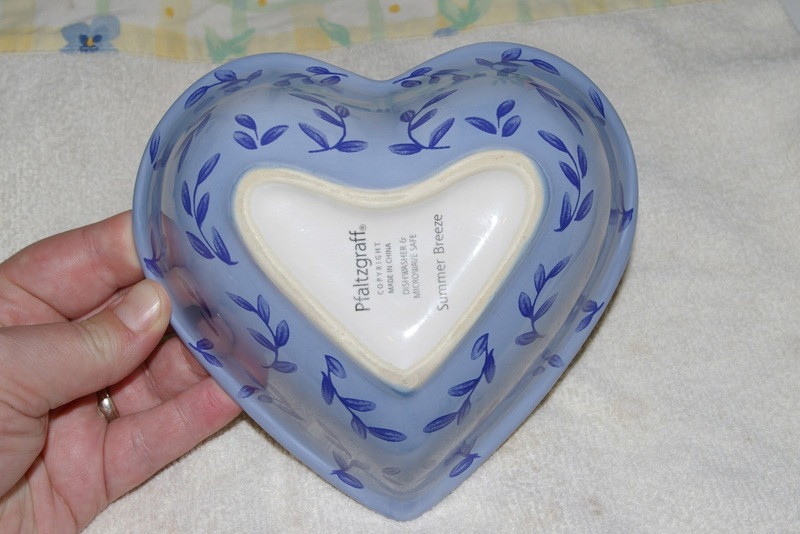 The soap in this Crappy Day Package and the cotton heart squares in this Crappy Day Package went very nicely in my bathroom! 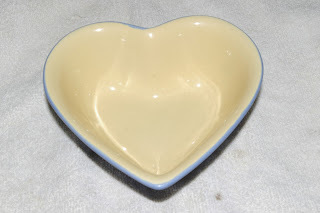 At the time, I thought it would be sweet to have a heart theme in the kitchen since cooking for my family was going to be one way I could show my love for them or so I thought, and I enjoyed cooking because years and YEARS of complaining about dinner had not yet beaten the joy and enthusiasm out of me. 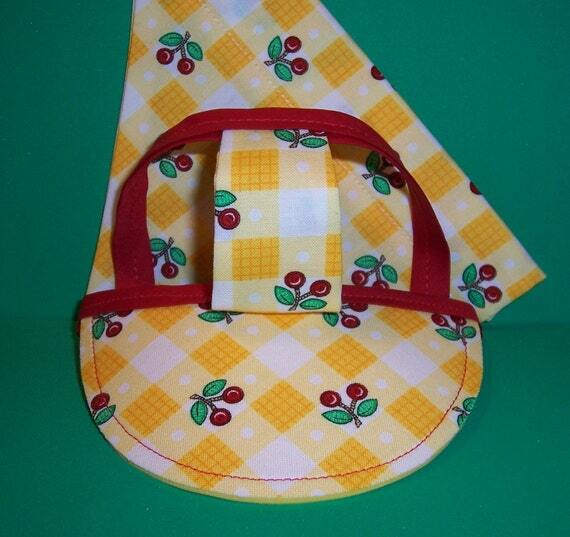 At some point, I found some beautiful, cheerful ME fabric that was yellow and white checkered, with rich, red cherries and I made shopping bags out of it. I also used fabric remnants I found to make cloth napkins. 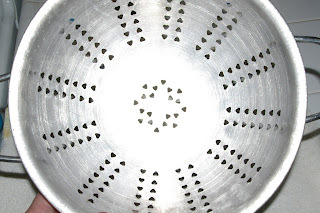 There is an entire SET of dishes in this pattern! I liked the yellow pattern on the dinner plates and LOVED the pattern and scalloped edges on the smaller plates. The regular bowls were not my favorite, but I could live with them, so, after 7 years of marriage, we finally had matching dishes! I tried ONCE AGAIN to match the paint for the kitchen to the blue on the dishes, and, AGAIN, it isn't quite right, but I still like it. 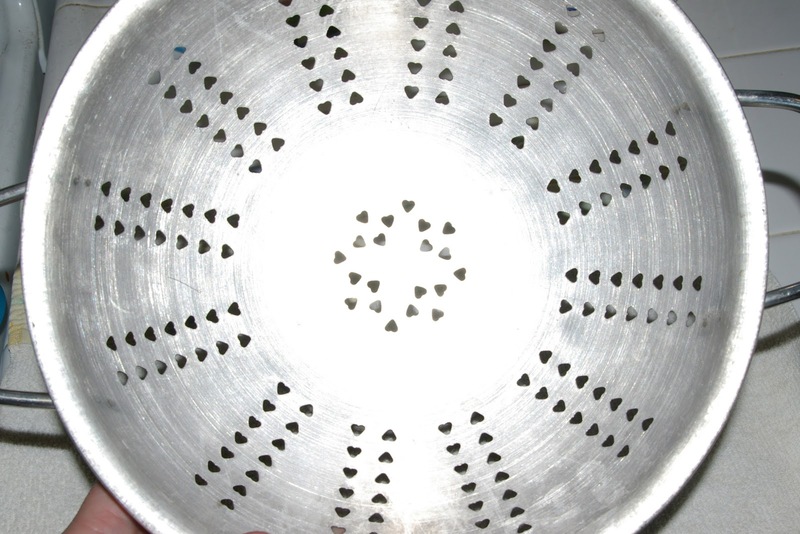 I love the pattern and colors on the bread pans too! 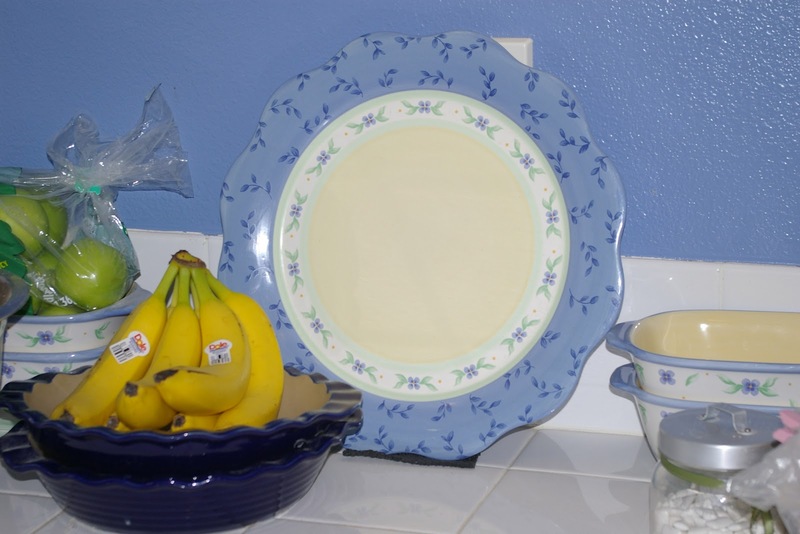 So, I have some of the pattern pieces for this set of dishes, and any other things I buy for the kitchen I try to get in the beautiful cobalt blue (like the pie pans in the picture above). Do not be deceived: the kitchen only looked like this for about 5 minutes while I took this picture for a friend. Normally, you can barely see the counters. 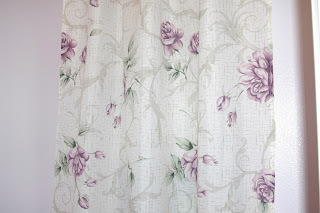 Oh, for the curtains, I found some thick, white fabric that had different brightly colored flowers embroidered on it. The other rooms in the house don't really have a theme. The family room is a very light shade of the blue from the kitchen and has blue furniture and brown furniture, the baby's room was painted light yellow, some of the kids wanted a pink room when we moved, so I found a nice shade of medium rose for that room (I found it to be more difficult to pick out a nice shade of pink than I had imagined!)....oh! The older boys' room ended up being a nature-themed room. This was a fun post! I loved seeing the rooms in your house. Everything is so pretty. So happy you're enjoying your vacation! Why on earth would someone install those two huge windows in your bathroom? Exhibitionist, much? It is SO fun to get to peek into your house! I should have mentioned that I have a window like that in my bathroom, too. Only one, but RIGHT where you would stand in the shower. Same size. What IS with that? Stupidest window EVER. I can understand having the windows for light, but is it really SO HARD to put in the clouded glass? I forgot to mention that the shower is also in the direct line-of-sight of the bed in our bedroom; there isn't a door between the two rooms. Good-bye privacy! I know this is a really old post... but I was trying to find someone who had decorated their kitchen to match their Pfaltzgraff Summer Breeze pattern and stumbled on this! I've had my dishes for 13 years now and they're in great shape and I'm still not tired of them, so I want to decorate the kitchen in my new home with the same. In my last place, I had the same cornflower/ weird purpley/ sky blue paint. I also found vinyl wall decals that might go well with your theme.... 'If music be the food of love, play on' -William Shakespeare.